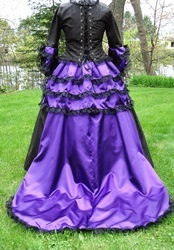 The Victorian Rose is a Victorian/Renaissance inspired bustled ball gown. I borrowed fashion elements spanning 300 years of history, and created a few of my own, so this gown is not authentic to any particular time period. I felt that by combining these elements I could offer a unique gown which would be perfect for many occaissions/events! 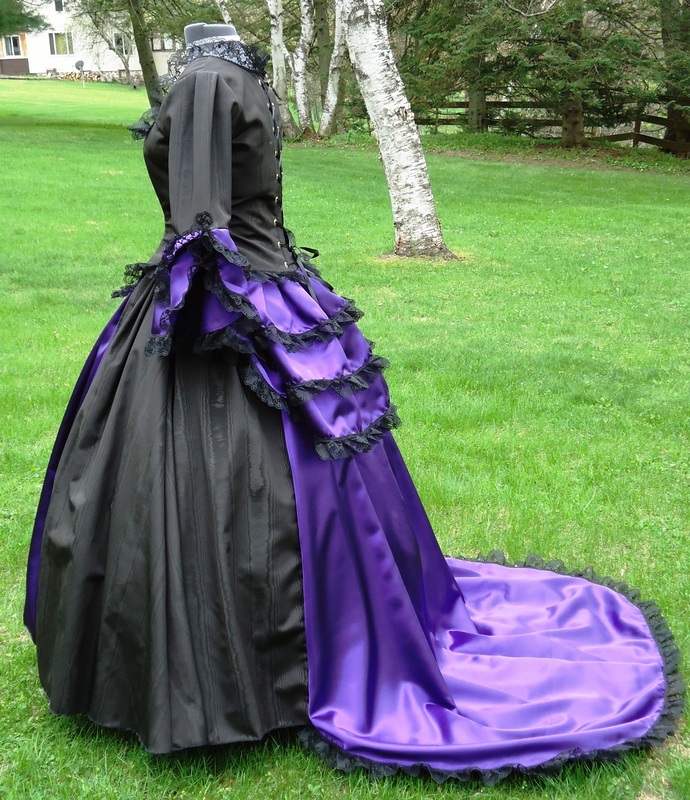 This gown is the 'little sister' of our Gothic Victorian Gown, but every bit as luxurious. 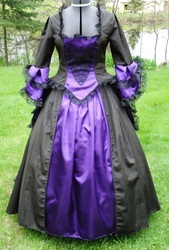 The bodice is fully lined and laces closed through heavy two piece grommets in the back, with boning along the laces. There is also boning in the front panel for support. There is a sewn-in modesty panel under the lacing which prevents skin from peaking out when laced, and further allows the bodice to fit up an additional two sizes. The bodice is trimmed with lovely black lace and has a beautiful heart shaped black appliqué on the front panel. As was the fashion of the Victorian era, the bodice is meant to be worn snug to the body. The elbow length sleeves are semi-fitted and finished with two layers of satin to create a bell shape extending to mid-forearm. The overskirt skirt has moiré taffeta sides and a satin back panel with a train. It has a set waistband that ties in the front for greater adjustability and comfort. 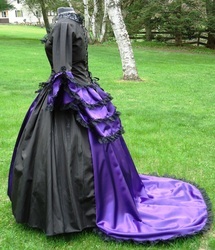 The underskirt is satin matching the forepart of the bodice. 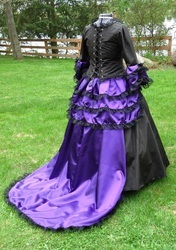 The detachable frilly faux bustle is made from matching satin trimmed with lace. It ties at the waist. This is the portion of the ensemble shown as lace trimmed layers when looking at the back of the gown. All skirts measure approx. 44” long in the front, with a additional 15+” train in the back of the overskirt which is lace trimmed The skirts have a serge finished hem which can be worn as is or easily hemmed if needed. 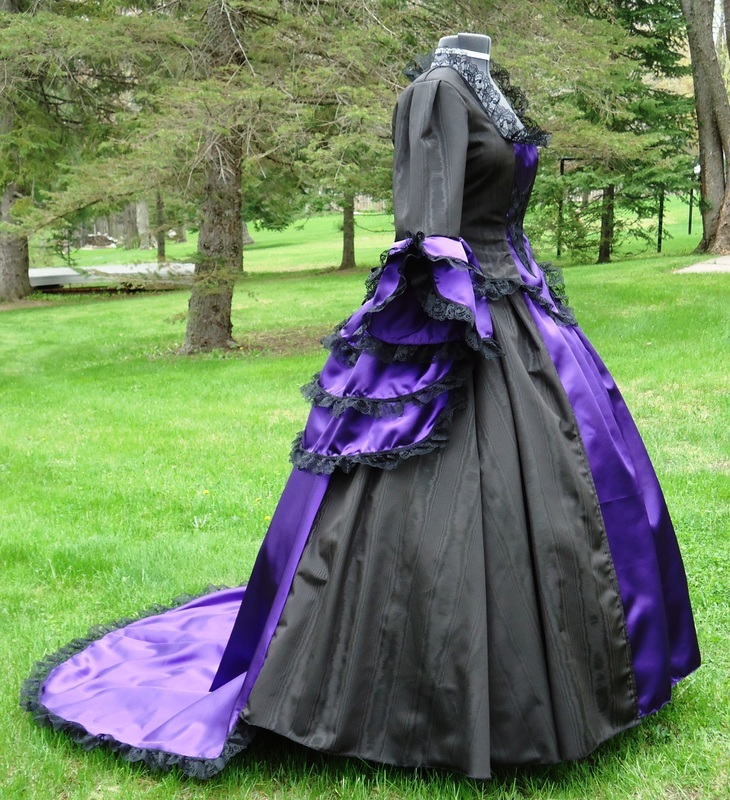 The ensemble is shown worn over a hoopskirt which is not included. This gown can be made in any combination of colors! If you would desire more expensive fabrics, such as substitution of brocade, silk, etc., your price may vary. We will be happy to quote you the price for constructing this gown to your specific requirements.